It was in 1946 that the Bell 47 was awarded the first commercial helicopter license, the WAC became the first American rocket to leave the atmosphere, TWA inaugurated international flights, and the Douglas B-43 flew as the first American jet bomber. It was that same year that 20-year-old Eugene Covert started work at the Naval Air Modification Unit’s Pilotless Aircraft Division on projects that would result in the Sparrow, the West’s famed primary air-to-air missile from the 1950s through the 1990s. Six decades later, MIT Aeronautics and Astronautics Professor Emeritus Covert’s accomplishments and honors are legendary. He’s a Fellow and an Honorary Fellow of several learned societies, and is member of the National Academy of Engineering. He’s the recipient of numerous awards, including the AGARD Von Karman Medal, the AIAA Ground Testing Award, AIAA Durand Lectureship, U.S. Air Force Exceptional Civilian Service Medal, and University Educator of the Year. In the spring of 2006, a business-suited Covert tips slightly back in his office chair, hands folded in his lap, staring over a visitor’s shoulder, pondering his years in aerospace. “My career was a set of building blocks,” he says. “I learned something every step along the way.” He says many of the steps “broadened,” and some were “broken” — but he gained in knowledge from every one. 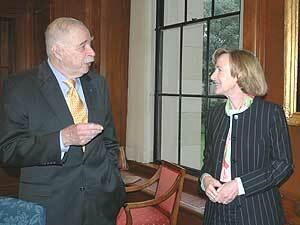 Covert’s career spanned research and teaching, to public service. In the 1950s, he conducted tests on numerous aircraft, including the famed F-4 Phantom, at the MIT Naval Supersonic Wind Tunnel. 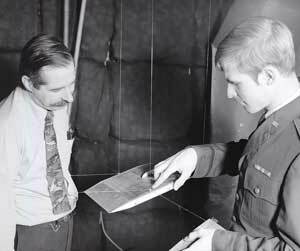 His interest in the problems of supporting models led him to develop the world’s first practical wind tunnel magnetic suspension system. From 1978-79, Covert was technical director of the European Office of Aerospace Research and Development. Later, he was a NASA consultant on the Space Shuttle main engine, and was a member of the commission that examined the Challenger accident. He was appointed to the MIT faculty in 1963, and was AeroAstro department head from 1985 until 1990. He also specified another comment. "In the course of my career I have had the opportunity to visit many places in the United States and throughout the world, including the South Pole, where I have met many very friendly, intelligent, and interesting people. The exception was the North Pole where we had to bring our own people." Gene is also known for his sense of humor. No one is a more appropriate recipient of the great Guggenheim Medal. For 60 years, students, faculty, academic leaders, engineers, policymakers, government agencies, professional associations — indeed, the entire breadth and range of the aerospace community — have been the fortunate benefactors of Gene Covert’s expertise, professionalism, insight, and wit. He is a treasure, and we at MIT are fortunate that we’ve had a good share of him — and expect to do so for the foreseeable future. Gene: congratulations on this magnificent, well-deserved honor.